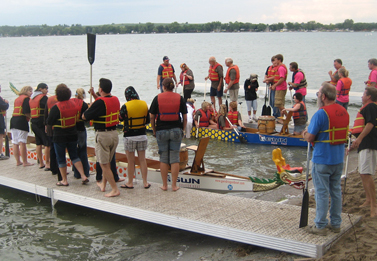 On the western shores of Lake Minnewaska the Starbuck Chamber of Commerce will host a 500 meter dragon boat race, with all the fun, food and fellowship that this sort of event can raise.This event should be great for family, friends and reunions. Each team will have at least two races. Each team’s cumulative time will be computed and placed in order according to combined time. The field of teams is separated into three divisions: Gold Division, representing the top third; the SilverDivision, representing the middle third; and the Bronze Division, representing the lower third of the field of teams. Your Team should be aware of the following documents.